Shopping for Star Wars Vinyl Figures? The Trandoshan bounty hunter from the Star Wars Saga is joining the Hikari family! Be careful to display this metallic gold Bossk somewhere secure, or you may have bounty hunters on your tail! 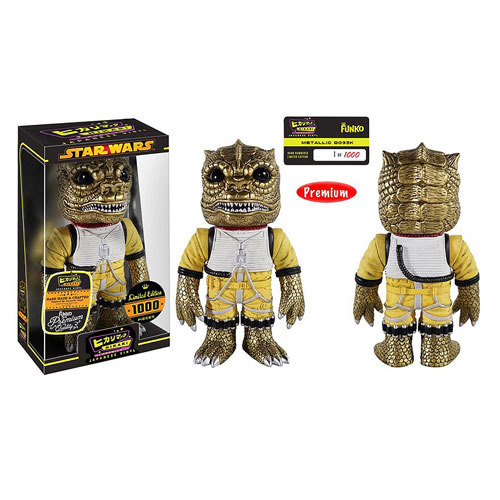 The Star Wars Bossk Metallic Premium Hikari Sofubi Vinyl Figure is limited to only 1000 pieces world wide. Colleague of scum like Boba Fett and Greedo, Bossk comes individually numbered and packaged in a window box. Ages 17 & up.